A Dragon Creation Ritual, Carp Transformation, jump the waterfall already you wet puppy. Traits: This ritual must be performed outdoors or in an open-air environment, and with a body of water and waterfall which are not completely sterile4 except for the carp, or it will not work. An adult5 carp6 must be used in this ritual, or the best-case scenario is that it will not work7. A sizable waterfall is necessary, but don't worry, it doesn't have to be nearly as big as the one at Henan. Simply create or find a waterfall large enough to be a challenge8 to the carp, and it will work. Nature: This ritual is basically an emulation ritual for harnessing the natural transformative magic of the wild Dragon's Gate ritual and placing it in a smaller, more accessible scale. The reason it works is by convincing reality that this is an acceptable substitute for the real deal. It's certainly not the only way to turn a fish into a dragon, but it's the least risky9 way to do it as long as you follow all the rules. Other Detail: A general feature of the "permitted" carp to go through this ritual is that they are all very heavy-bodied, and very hungry. Goldfish and koi work best for this ritual because you can train them to jump the waterfall in return for a reward, while other carp may simply ignore the waterfall in favor of eating whatever they can find in the main body of water. that once hid in the shallows." 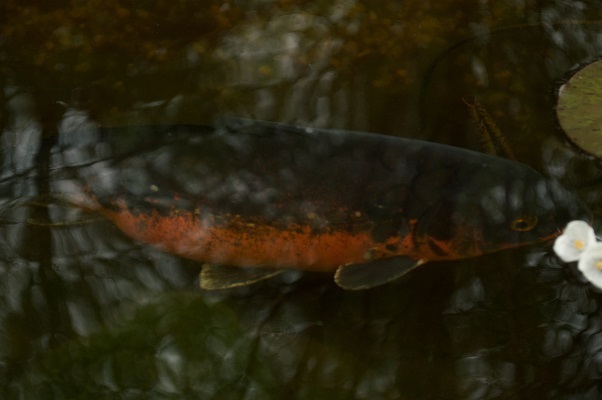 "Redfin Carp pledged a solemn vow. "I shall swim beyond the Dragon Gates. I shall brave the perilous bolts of fire and lightning. I shall transcend the estate of ordinary fish and achieve a place among the order of sacred dragons. I shall rid myself forever of the terrible suffering to which my race is heir, expunge every trace of our shame and humiliation." Waiting until the third day of the third month, when the peach blossoms are in flower and the river is full, he made his way to the entrance of the Yü Barrier. Then, with a flick of his tail, Redfin Carp swam forth. You men have never laid eyes on the awesome torrent of water that rolls through the Dragon Gates. It falls all the way from the summits of the far-off Kunlun Range with tremendous force. There are wild, thousand foot waves that rush down through gorges towering to dizzying heights on either side, carrying away whole hillsides as they go. Angry bolts of thunder beat down with a deafening roar. Moaning whirlwinds whip up poisonous mists and funnels of noisome vapor spitting flashing forks of lightening. The mountain spirits are stunned into senselessness; the river spirits turn limp with fright. Just a drop of this water will shatter the carapace of the giant tortoise, it will break the bones of the giant whale. It was into this maelstrom that Redfin Cary, his splendid golden-red scales girded to the full, his steely teeth thrumming like drums, made a direct all-out assault. Ah! Golden Carp! Golden Carp! You might have led an ordinary life out in the boundless ocean. It teems with lesser fish. You would not have gone hungry. Then why? What made you embark on this wild and bitter struggle: What was waiting for you up beyond the Barrier? Suddenly, after being seared by cliff-shattering bolts of lightning, after being battered by heaven scorching blast of thunder-fire, his scaly armor burnt from head to tail, his fins singed through, Redfin Carp perished into the Great Death and rose again as a divine dragon─ a supreme lord of the waters. Now, with the thunder god at his head and a fire god at his rear, flanked right and left with the gods of rain and wind, he moves abroad with the clouds in one hand and mists in the other, bringing new life to the tender young shoots withering in the long parched desert lands, keeping the true Dharma safe amid the defilements of the degenerate world. Had he been content to pass his life like a lame turtle or blind tortoise, feeding on winkles and tiny shrimps, not even all the effort Vasuki, Manasvi, and the other Dragon Kings might muster on his behalf could have done him any good. He could never have achieved the great success that he did." 2. Sharkie is a Doitsu koi. Fortunately, when bred with a properly-scaled male, the offspring are always scaled koi. Performing this ritual with a Doitsu koi is what I like to call a bad idea. Dragons generally need their scales, after all! 4. Yes, this means that it needs plants and other critters in there. Yes, this means that the carp is probably going to get distracted by eating instead of jumping the waterfall. Yes, this is frustrating as everything. 5. Adult in this case means of breeding age and exceeding a foot, although the fish in question can be sterile. "Cheating" the measurements by using a long-finned carp occasionally works, but it's best not to risk it. 6. Ctenopharyngodon, Cyprinus, Hypophthalmichthys, Mylopharyngodon, Carassius, and Cirrhinus carp are all viable options. Make sure you know what carp you are using before beginning the ritual. 7. I still haven't found the tench/koi hybrid, and quite frankly I don't know how it survived. 8. Some fish are better jumpers than others, and your ritual must take the jumping ability of that particular fish into account! 10. In my experience, dragons created by this ritual tend not to be as bright as their wild counterparts, so it's a very good idea to stay away from them until they get their bearings, unless the dragon recognizes you from being a carp. 12. Preferably made of natural materials such as clay or wood. Stone and metal work too, although you have to put more magic into them. Anything really derived, like plastic, is more touch-and-go. 16. I think you're supposed to use your initials, buddy. 18. Wait, you called yourself Judicator? 20. I'm never forgetting this.